Whistleblower Jonathan Sugarman and Fianna Fáil's John McGuinness outside the Central Bank today following their meeting with Governor Phillip Lane. THE CHAIR OF the Oireachtas Finance Committee said he is shocked following his meeting today with the Central Bank over how the bank acted after a complaint from former Unicredit Ireland executive and whistleblower Jonathan Sugarman. 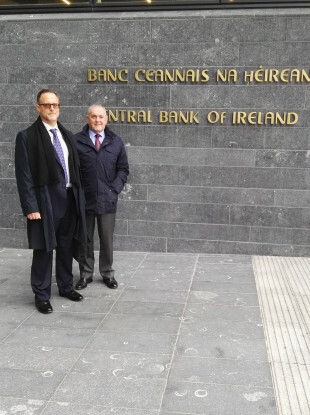 Sugarman and Fianna Fáil’s John McGuinness met with Central Bank Governor Philip Lane to discuss the issue. Following the two-hour long meeting, the Central Bank released a statement confirming that Lane met with the pair – adding that it had investigated the Unicredit claims and that it considered the matter closed. However, both McGuinness and Sugarman feel that the issue remains unresolved. The Fianna Fáil TD said he thought it was “extraordinary” that the Central Bank carried out its investigation into Unicredit without speaking to Sugarman, the whistleblower who reported the breaches. “I would have thought he would be central to the investigation,” he added. Sugarman said he was hoping for a better outcome from today’s meeting, stating that he still thinks his concerns are being ignored. “I walked in hoping I would get somewhere but the attitude was so counterproductive. Surely after ten years we have all seen the consequences of a lack of regulation. We are discovering that now with the tracker mortgages,” he added. Sugarman – the bank executive-turned-whistleblower – has been fighting this case for over ten years. He was the risk manager at Unicredit Bank Ireland in 2007. This was the Irish arm of Italian firm Unicredit, one of the largest banking and financial services companies in the world. It was Sugarman’s job to make sure that the company’s Irish arm was sticking to the rules. The lender was allowed to drop below a certain percentage point, but any breach in excess of this was meant to be reported to the banking regulator, the Central Bank. Sugarman said Unicredit Ireland was frequently breaching its liquidity requirements, and on occasion would only be holding enough cash and assets to meet 70% of its debts. Uneasy with what he had found, he resigned from Unicredit after notifying the Central Bank of the issue. He also turned himself in to Rathmines Garda Station in 2009 but alleges nothing was done. At a recent meeting of the Finance Committee, where Jonathan Sugarman previously gave evidence, it was agreed with the governor that he would arrange this meeting – that meeting took place today. McGuinness told TheJournal.ie this afternoon that the manner in which Sugarman has been treated for highlighting wrongdoing sends out all of the wrong messages to whistleblowers. “They are afraid and I can understand why,” he said. Obviously today’s meeting was a box-ticking exercise, they ticked the box by closing the case and letting it remain close. I think the Irish people would like to know the answers as to what they did after the investigation into Unicredit. Did they fine the bank? Did they penalise them in some way – what did they do? I would have at least expected them to arrange a further meeting with Jonathan Sugarman on his own so that he could give the full-scale of the facts and then let the bank determine against their analysis and investigation whether or not there were gaps in what they were told. McGuinness said the Central Bank had no interest in meeting with Sugarman again, even though he believes Sugarman can offer an insight into the culture within the banks. “The offer was there from Mr Sugarman to inform them, to give them information, to be available to them, at the very least, and the answer from the bank without any consideration was no – case closed. I can’t accept that this case is closed, I will not accept it. I hope the Central Bank will review what was said at that meeting… and decide to do something different than to close their eyes to what is happening. “It is all very relevant and it is as relevant today in terms of regulation as it was back then,” he said. It is beggars belief how they could not take into account what was being said this morning. I was quite shocked by it. McGuinness said the Central Bank has let down Sugarman, stating that as a risk manager, Sugarman followed the legislation to the letter by reporting the breaches. “He walked in the front door of that bank and told them about a wrongdoing and told them about a breach in law and … they never spoke to the person that made the complaint and that in itself is quite shocking,” he said. Sugarman told TheJournal.ie that he doesn’t regret his actions. “I don’t regret it because I can look myself in the mirror. I am a proud citizen of this country and when I pledged allegiances to it, I pledged to uphold its law,” he said. McGuinness said he will now bring a report of this meeting to the attention of the Finance Committee members. A statement from the Central Bank acknowledged the importance of whistleblowers in the financial sector, stating that they can provide valuable information to the Central Bank in order to help it to achieve its regulatory mandate. All such disclosures are investigated and actions are taken, when appropriate. Actions may include the issuance of supervisory warnings or risk mitigation programmes to firms, and in more serious cases may result in administrative sanctions and fines. Email “'Shocking': Central Bank governor meets whistleblower Jonathan Sugarman over bank probe”. Feedback on “'Shocking': Central Bank governor meets whistleblower Jonathan Sugarman over bank probe”.